Talking with a good friend whose breastfed daughter was the same age as my little one, and also not sleeping through the night, reassured me that there was nothing “wrong” about our situation. We agreed though that we were ready for more consistent sleep stretches and began researching gentle night-weaning strategies, thinking we might approach this next big step together so we could support one another through the ups and downs. We spent two months researching and delaying [trying to choose the best time to start – when the littles were not sick or teething, we had a few days off work, not during a trip out of town, etc], and then, as luck would have it, both of our girls began sleeping through the night on their own around 18 months old. How’s that for irony? Even though I ended up not needing to move forward with a night-weaning strategy, I thought it would be helpful to share what I learned with my fellow sleep-deprived mamas of toddlers, as well as answer some of the most common questions we get as Lactation Consultants regarding nighttime breastfeeding of a toddler over 12 months old. Why is my 1-2 year old waking at night? It’s important to remember that there are a variety of reasons your little one may continue to wake throughout the night. These reasons can include hunger, a need for comfort, pain from teething/illness, and external factors such as noise, just to name a few. 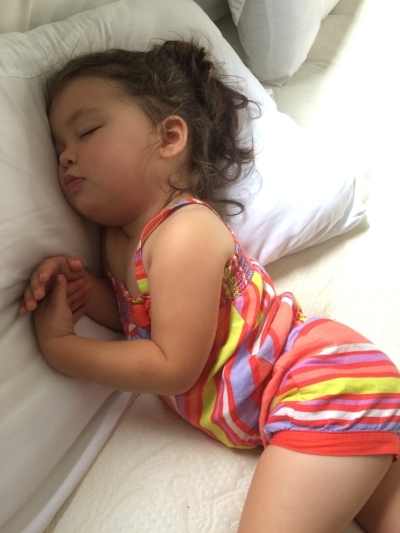 Even though you may be using breastfeeding as the primary means to settle your toddler back to sleep, it may not be the reason your little one is waking in the first place. If you are able to pinpoint a cause for the night waking [such as your little one being too hot/cold], then you can oftentimes make a simple change [adjust the temperature of their room by using a fan/space heater] to decrease nighttime wake-ups. What are some options for approaching nighttime weaning? This method uses gentle behavior modification by slowly reducing the total time spent breastfeeding at night, while replacing the nighttime nursing sessions with another comfort measure. Depending on the age of your toddler and their understanding of verbal cues, some mothers find that using a verbal cue [and possibly ASL sign] for the end of a nursing session can help transition baby off the breast more smoothly. Many toddlers already use a sign or word to ask for milk, and this idea flips that routine to the ending of the nursing session. Once your toddler responds well to mommy saying, “bye-bye milk” or “all done milk,” or another phrase that works for you, this technique can usually be transitioned into explaining that when it’s dark, or nighttime, mama’s milk goes night-night too. Will my milk supply decrease if I choose to night wean? The short answer is, yes it probably will. However, for most breastfeeding mothers, the dip in supply will not be drastic enough to cause any adverse effects on the breastfeeding relationship. Now that your little one is a toddler and should be eating plenty of solid foods throughout the day, the small dip in supply will likely go unnoticed. As long as your toddler continues to nurse during the day, you will continue to produce breastmilk for him/her. 1. Enlist the help of a support person. No matter which path you take, nighttime weaning will involve providing comfort for your toddler in another way besides breastfeeding. Having another adult, whether this is your partner, a grandparent, your best friend, or a postpartum doula, available at night to help provide this comfort and/or support you through this change will be immensely helpful. 2. Create a bedtime routine and stick with it. If you haven’t already, I highly recommend you come up with a simple bedtime routine that you do with your toddler each night. Consistency is important for helping to establish boundaries and teach your little one what to expect during the night. Bedtime routines do not have to be elaborate. Something basic such as: bath, pajamas, story or song time, breastfeeding, toddler laid down in their sleep space, is all it takes. 3. Remember, it doesn’t have to be all or nothing. If your little one is waking multiple times throughout the night, you may wish to focus on eliminating one nighttime breastfeeding session at a time. Taking this slower approach can be helpful for avoiding engorgement as well. 4. If at any time during the night weaning process you have second thoughts or feel as though this isn’t the best decision for you and your family, then stop. You aren’t signing a contract when you embark down this path, and it’s okay to stop the process and wait to start again in a few weeks or a few months. Trust your gut and your mama instincts.